Aura of Positivity: Why do we perform post wedding ceremonies? Indian weddings are all about a festive celebration among two families, that unites them together in the auspicious bond of love. Traditional values and cultures are most highlighted during the ceremonies beginning from engagement to the wedding day. Yet the big fat wedding doesn’t end here till the newly-wed couple arrives at the door of the house, thinking it to be the completion of all the customs but to their surprise so much more is waiting for them. Indians must have experienced or watched the post wedding customs in all the drama series and movies on television, in which the bride and groom are warmly welcomed by the groom’s family at the door step. Here we’ll discuss further about their relevance. The Dwar Roka ceremony is performed in which the couple is not allowed to enter the house, until the groom gives some expensive gift or cash to her sister and other cousins. The sister-in-law demands a gift from her brother as it is a symbol of the beginning of new relationships and ties a hot and sweet bond between the bride and her sister-in-law. 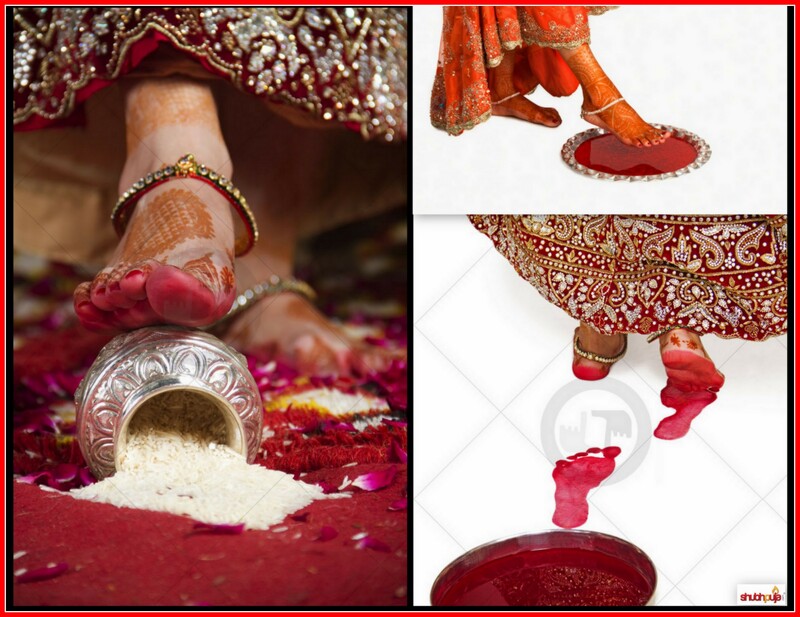 Then the mother-in-law welcomes the couple with the traditional ‘Aarti’ and the bride enters with her right foot and kicks a vessel filled with rice and coins. The Griha pravesh ceremony is a house warming ceremony to fill up the space with kindness, tolerance, patience, generosity, humility and selfless love. By kicking the vessel at the doorstep, it symbolise the beginning of new era for the family and it denotes the arrival of happiness and wealth in her marital home. Bride being the symbol of Goddess Lakshmi, is the sign of wealth and prosperity, thus it signifies the arrival of wealth and prosperity. The reference of ‘Kalash’ has also been made in the Rigveda considering it a symbol of prosperity. It is a literal cosmos transceiver. These ceremonies neutralises the evil aura, inside and outside the house, removing all the negative energies and bringing a new ray of positivity along with the new bride. This entry was posted in Puja, Rituals and tagged astrology, auspicious, blessings, book now, bride, celebration, coin, customs, devil, door step, Dwar roka ceremony, energy, environment, evil, evil aura, faith, family, fortune, goddess Lakshmi, Griha Pravesh, groom, happiness, have a little faith, Hindu, hinduism, house warming ceremonies, kalash, neutralises, newly wed couple, positive, prosperity, relevance, religion, rice, right foot, Rigveda, Scientific, shubhpuja, shubhpuja.com, sister in law, traditions, values, wedding, wedding puja. 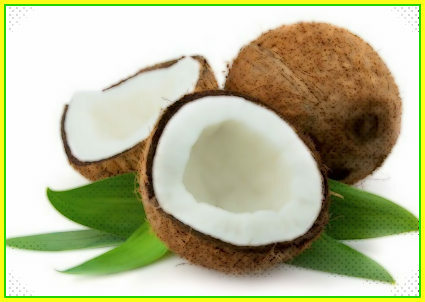 Sriphala :God’s own fruit – Why is breaking coconut considered auspicious? The wish fulfilling tree or also known as ‘kalpa vriksha’ in Sanskrit is considered auspicious for providing the necessities of life. It is said, that Adi Shankara replaced the ‘bali’ sacrifice of human beings by coconut, to achieve the fulfilment of desire by performing religious ceremonies. Coconut is referred as human head, where the outer hard shell is similar to physical body and the kernel to the subtle body. The marks on the hard coconut body are also considered to resemble the three eyed Lord Shiva, who is the Lord to fulfil our wishes and desires. The purest offering to Lord is coconut, which is unadulterated and pure due to the outer hard shell. Devotees please the Lord by making a pure offering and portraying the intensity of their prayers. We have often seen people breaking coconut before the beginning of auspicious ceremonies or at the beginning of a profitable venture; it is because the coconut is loved by Lord Ganesha. Devotees remember Lord Ganesha by breaking the coconut and getting rid of all the evil energies and negative hurdles. It is also said that the ceremony of breaking the coconut resembles the breaking of human selfish motives like greed, ego and pride. As the coconut breaks, the human ego or ‘ahankaar’ is broken and shattered in front of lord, by achieving the oneness with supreme God in the Universe. As the physical myth or ‘maya’ is smashed away, one can taste the sweet untouched nectar of divine bliss. Every part of the coconut fruit along with its tree is beneficial for human existence. Parts like trunk, leaves and coir are used in making of thatches, mats, furniture, oils and soaps. The coconut tree soaks the salty water from the ground and transforms it into sweet nourishing water which is especially recommended for patients. Special parts of the tree and fruit are used in the preparation of ayurvedic medicines and the consumption of the fruit is really healthy. “Water the plant for five years, reap coconuts for life” is an appropriate saying to define the significance of this auspicious fruit. This entry was posted in Mythology, Puja and tagged ahankaar, ancestors, astrology, auspicious, awesome, ayurveda, blessings, book now, celebration, coconut breaking ceremony, coconut fruit, desire, devil, devotees, divine, energy, environment, evil, faith, fortune, fruit, fulfilment of desires, healthy, hinduism, Hindus, human ego, human head, leaves, lord shiva, maya, medicines, negative, oneness, outer hard shell, relevance, religious, Scientific, sick, soft kernel, Sriphala, Supreme Lord, sweet nectar, trunk, wishes. Revitalising the spot of wisdom: Why do we apply Tilak? “A forehead without a Tilak, a woman without a husband, a Mantra the meaning of which is not known while doing Japa (recitation), the head that does not bend before holy personages, a heart without mercy, a body devoid of health, a custom without purity,… – all these are worthy of condemnation. They exist for name’s sake only.” Our holy scriptures have mentioned the vitality of ‘Tilak’ or ‘Bindi’ applied between the space between two eyebrows. According to varied traditions, different types of Tilaks are applied using different materials. The red kumkum tilak symbolise power, valour and dynamism indicating the devotees of Goddess Shakti or Durga. The U shaped tilak of sandalwood paste symbolise purity, calmness and tranquillity indicating the devotees of Lord Vishnu. The three horizontal lines (tripundra) of Vibhuti or yagna ash signifying wealth, fortune and devotion of the Shaiva group of worshippers. The three horizontal lines of holy ashes, with or without a red dot symbolise the worshippers of Lord Shiva. Our human body is a source of energy and it continuously emits electromagnetic waves through certain special points. The Aajna Chakra or brow chakra connects to the Bhramanadi i.e. the main spot of wisdom, memory and thinking. This entry was posted in Puja and tagged Aajna Chakra or brow chakra, accupressure point, ancestors, artificial decorations, auspicious, ayurveda, beneficial, bestow, Bhramanadi, bindi, blessings, cooling effect, custom, decorative bindis, energy release, evil, evil energies, forehead, Goddess Durga, happiness, Hindu, hinduism, immmunity level, insomnia, kumkum tilak, Lord, lord shiva, Lord Vishnu, mark on forehead, memory, pious, pooja, power, puja, puja package, religious, rituals, Scientific, shakti, shubhpuja, shubhpuja.com, significance of wearing Tilak, tilak, tripundra tilak, valour, vibhuti, wisdom. Being judgemental or framing prior opinions in our thoughts are the common trait of homo sapiens. “Oh my god, I saw his face right in the morning, now my entire day is ruined. I don’t like him at all or I like this in him”; such optimistic and pessimistic thoughts are flying within us the entire day. To halt these constant commenting inside us, our Vedas and spiritual sciences have bestowed us with an easy way. 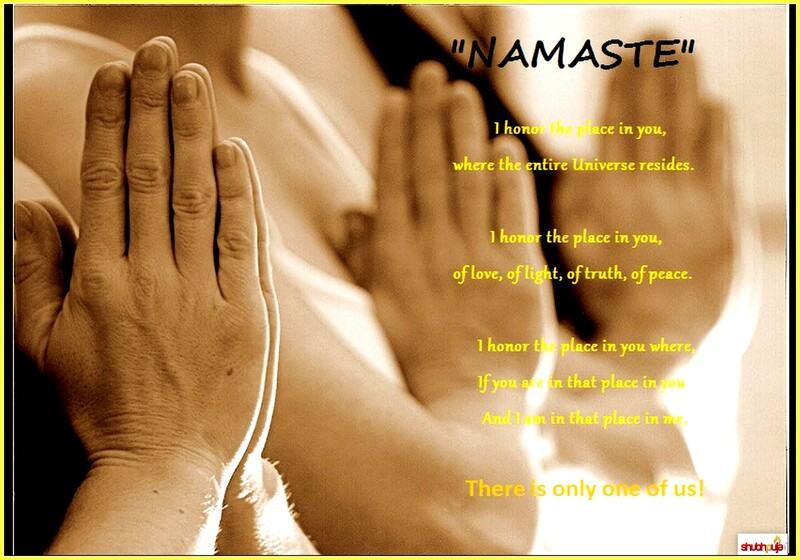 Greet everybody with a smiling ‘Namaste’ and the instant results can be experienced. Here we’ll discuss about the magical effect that this salutation brings in our lives. Thus the salutation refers to offering gratitude to the divine power within every being, which has created the existence. Here the soul in one acknowledges and pays respect to the soul in another. The Namaskar mudra is a symbol of combing the goods and odds in a being. The mudra along with uttered word invokes the ‘Akashtattva’ and the ‘Pruthvitattva’, which are the higher level of divine consciousness absorbed by the body. The realization of oneness in all beings is expressed by bowing the head down to another revered being. It eliminates the ego and other evil energies, inside and around us. As we join our hands, the Sattva frequencies are attracted by our finger tips and transmitted through our thumb, in the entire body that automatically awakes the ‘Anahat Chakra’. The salutation attracts the divine consciousness (Chaitanya) and the actual state of spiritual growth depends upon the spiritual emotion (Bhav) of the doer. Bend the arms from the elbow upwards and face the two palms of the hands. Place the two palms together and keep the folded palms in front of the chest. The fingers should be relaxed and space should be left between them. Utter the word ‘namaste’ or ‘namaskar’ by bowing the head down and touching the mid-brow region. Firstly the act of shaking hands is avoided due to hygienic purposes and avoiding contact related diseases like bird flu, influenza and so on. Further physical contact leads to the sharing of energies between them strongly, where the chances of transferring ‘Raja-tama’ (sexual purity) is prominent. Our motive is to increase the ‘Sattvikta’ component and not reduce it. Moreover, the namaskar between two people results in sharing spiritual frequencies between two people through various points in the body, as proven by science and also in one of the research by Ms.Priyanka Lotlikar. Every time you perform your ‘saadhna’ by joining your hands together, there is a certain gush of energy flow into your body and you transform into a ‘state of giving’ and prosper spiritually. This entry was posted in Puja and tagged Astitva, astrology, auspicious, awesome, bestow, blessings, body, book now, contact diseases, creation, devotees, dharma, divine, energy, energy flow in body, environment, existence, faith, fortune, future, have a little faith, joining hands, Namaskar, namaskar mudra, Namaste, obeisance, offering gratitude to divine, pessimist, pooja, problems, puja, Raja-tama component, relaxed, saadhna, Sattva component, shubhpuja, shubhpuja.com, spiritual significance.